(TibetanReview.net, Dec11, 2016) – The Dalai Lama on Dec 9 delivered a public lecture on Meaning of life and secular ethics in the Thyagaraj Stadium on the occasion of the 50th anniversary of Tibet House, New Delhi, and the 100th year of the founding of the Men-tsee-khang, the Tibetan Medical and Astrological Institute, Dharmshala. The theme of the occasion was ‘Awakening the sanctity of life: Healthy Mind, Healthy Body’. The exiled spiritual leader of Tibet spoke about the importance of education and the secular, universal relevance of the mind science and philosophical aspects of the teachings of the Buddha. In this connection he said India’s nuclear physicist Raja Ramana had noted that ancient Indian Buddhist master Nagarjuna’s thoughts had pre-empted views now expressed in quantum physics. He also noted that famed cognitive therapist Aaron Beck had concluded that feelings of anger and attachment were 90% mental projection, which he explained corresponded to what Nagarjuna had advised. Guests for the occasion included the Lt-Governor of Delhi Najeeb Jung, India’s Minister of State for Home Affairs Mr Kiren Rijuju, the exile Tibetan Kalon (minister) for Religion and Culture Karma Gelek Yuthok, and former director of the Indira Gandhi National Centre for the Arts Ms Kapila Vatsyayan. Earlier in the day, the Dalai Lama took part in a Facebook live conversation with Mr Kailash Satyarthi, founder of the Kailash Satyarthi Children’s Foundation and co-winner of the 2104 Nobel Peace Prize. He was later the Chief Guest at the 5th Annual Convocation of Ambedkar University, Old Delhi. The university had been functioning for eight years and during the 5th convocation, 549 students graduated, including its first PhD. 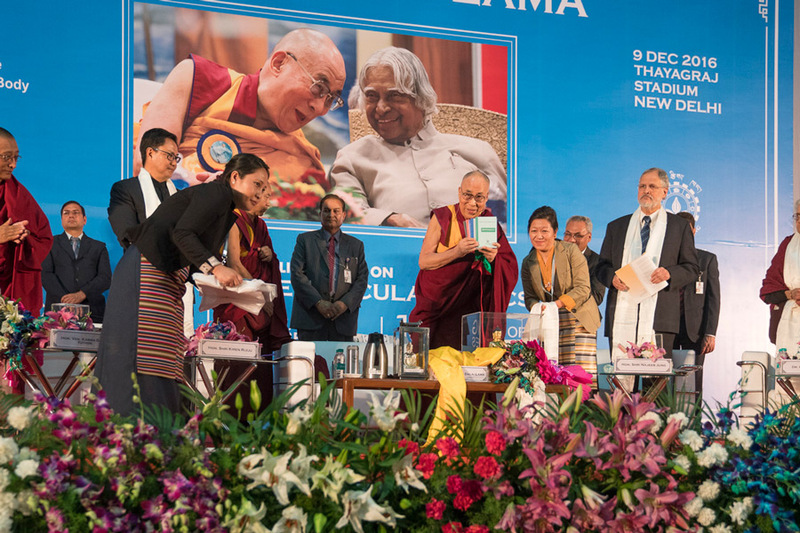 Chancellor Najeeb Jung, the Lt-Governor of Delhi, said the Dalai Lama’s concept of universal responsibility had been a strong influence at Ambedkar University.